Unbelievable! Yet another month has come and gone in the life of the KawaiiPunk blog! And what incredible month it was! A month in which we saw a cute tennis ball, a gravely Gargoyle Mascot, and even a Puzzle Mascot puzzle cube! And let’s not forget the amazing crafters and designers we met along the way… Red & Main, Oborocharms, and Doodle Garage to name a few! 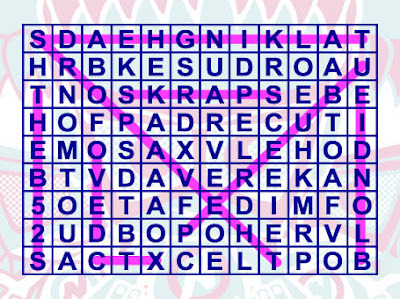 And what about our musical monthly puzzle? Did you find the New Wave Mascot’s favourite eight bands? Amazing! They were Talking Heads, Blondie, The B52s, Sparks, Devo, XTC, Pere Ubu, and The Vapors! I guess that guy really likes his music, huh? Anyway, that’s all your cute goodies for this month, folks, but be sure to come back next month when we’ll have plenty more tasty kawaii treats for you all to enjoy! And we’ll even have another puzzle too! See you all in August. This blog belongs to the KawaiiPunk Mascots. It aims to bring it's readers the best kawaii goodies the world has to offer and provide a quality kawaii blog for fans of cute everywhere. It's just a shame nobody told the Mascots that! At kawaiipunk.com you can find out all about the KawaiiPunk Mascots, download cool kawaii wallpapers, and find out where to buy the best KawaiiPunk clothing and gifts. Link to the KawaiiPunk Blog with this super cool button thing! Bookmark, share, subscribe to, make friends with, and follow KawaiiPunk! Amazing! Sounds Search! New Wave Mascot! Rilakkuma & Friends Easter Egg Magnets + Giveaway! ZT for Kids! : We have winners!! Please visit this super cool sponsor! You won’t regret it! KawaiiPunk logos, mascots and artwork © Michael Togneri, 2008-2012. The KawaiiPunk Blog is maintained in conjunction with www.kawaiipunk.com, www.cafepress.com/kawaiipunk and www.zazzle.com/kawaiipunk.